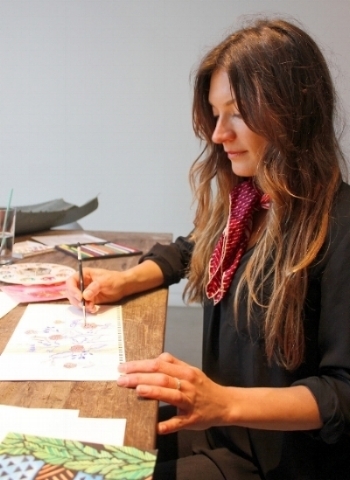 Ashley Chase is a designer, product development manager and artist, based in Los Angeles. She grew up between Conanicut Island and Martha's Vineyard, and quickly fell in love with the sea. As a child, she was inspired by the steel fishing boats and classic wooden sailboats in the harbors, the verdant landscape of the islands, and the constant yet ever-changing ocean. Later, Ashley drew inspiration from traveling to places like Japan, Europe, Central America, and Indonesia. It was while living in Bali that she launched her swimsuit label Ulu, and later a beach lifestyle brand SeaLove, which was featured in boutiques and five-star resorts around the world. She has built brands from the ground up, managing design, production and operations from the initial concept through the final launch. Since moving to Los Angeles, she has worked with brands throughout categories, with a strong focus in swimwear, apparel, outerwear and apothecary, to help bring their products to market. Ashley has over a decade of experience in design, product development and project management, and she looks forward to sharing these passions with you as she continues to create.